Like many of its neighbors in Africa, Burundi produces microlots almost by default: Each farmer owns an average of less than even a single hectare, and delivers cherries to centralized depulping and washing stations, SOGESTALs (Sociéte de Gestion des Stations de Dépulpage Lavage), and it may take more than producers’ delivery in order to create a lot. Depending on the leadership and management at the stations, both private- and state-run, the attention to detail in the processing makes a big difference, with meticulous sorting, fermenting, and washing necessary to create quality and uniformity among the coffee. The typical processing method in Burundi is similar somewhat to Kenya, with a “dry fermentation” of roughly 12 hours after depulping, followed by a soak of 12–14 hours in mountain water. Coffees are floated to sort for density, then soaked again for 12–18 hours before being dried in parchment on raised beds. We have been visiting this tiny country (barely the size of Maryland) since 2006, cupping coffees from more than 50 different washing stations, trying to figure out what makes Burundi coffee so special, and so different—even from relatively nearby Rwanda, the country with which it’s most often paired and compared. 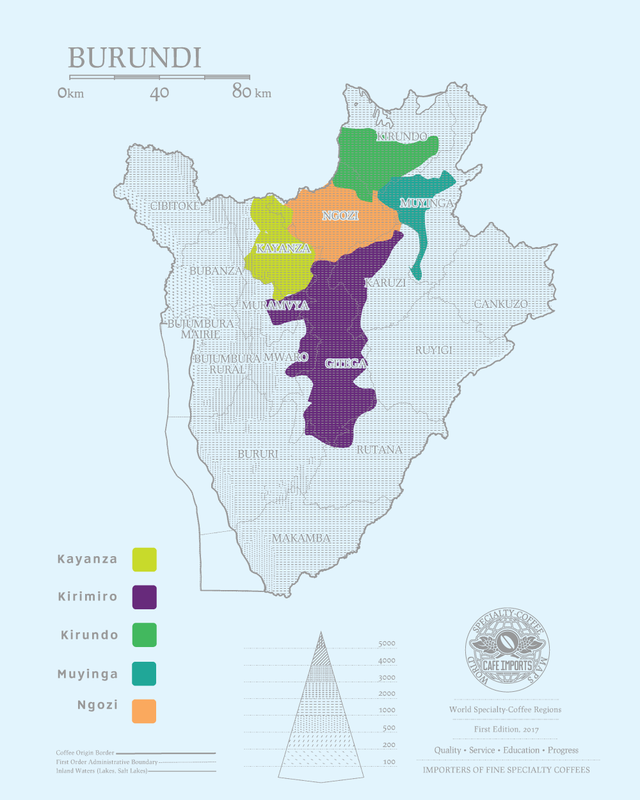 Logistically, sourcing microlots here (and getting them out of the country) is difficult: It’s a landlocked country, one of the poorest in the world, and still burdened by a history of political unrest thanks to a brutal colonial history and the aftershocks that will, like any colonial history, be felt for generations to come. The coffee, though? It’s worth it. Every year, we await Burundi coffees with giddy anticipation: The best of them are often stunning, pushing the highest reaches of our cupping scores. These are sugar-fruit coffee: fig jam, floral, sparkling with citrus. Before anyone thought to seek out (and pay for) specialty coffees from here, however, these lots were lost in bulk, commercial exports. Jason A. Long, Café Imports head of sourcing and CEO, was one of the first champions of Burundi as a specialty-coffee origin to watch, and he remains dedicated to discovering and bringing to market the microlots with the most character, structured acidity, and, yes, plenty of sparkle.